Summary: Opening opposite the Nicolas Cage comic book adaptation are "This Means War," starring Reese Witherspoon, Chris Pine and Tom Hardy, and animated pic "The Secret World of Arrietty." Action could trump romance post-Valentine's Day as Nicolas Cage sequel Ghost Rider: Spirit of Vengeance looks to dominate the long Presidents Day weekend. 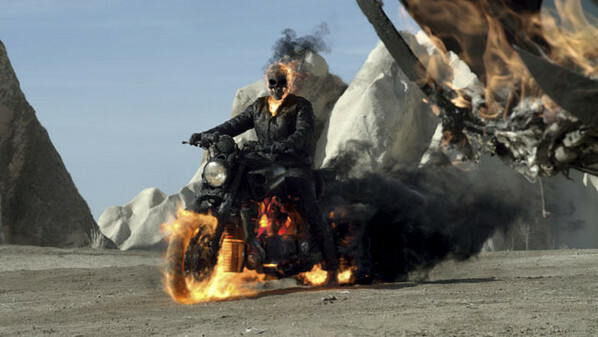 The first Ghost Rider, opening on the same weekend in 2007, turned into a surprise box-office hit, opening to $45.4 million domestically and ultimately cuming $228 million worldwide. Screen Gems and Spyglass' The Vow and Universal's Denzel Washington-Ryan Reynolds starrer Safe House are expected to remain strong players in their second weekend following powerhouse openings last weekend. On Valentine's Day alone, The Vow, pairing Rachel McAdams and Channing Tatum, grossed a record-breaking $11.6 million, the best midweek showing ever for the holiday. The Vow's domestic gross through Tuesday was $56.1 million, while Safe House's was $49.2 million. Fox's This Means War, starring Rachel McAdams, Chris Pine and Tom Hardy, will battle to catch up with Safe House and The Vow in its official debut. A romantic action comedy, This Means War grossed a strong $1.7 million in a preview on Valentine's Day. Conservative estimates show This Means War posting a four-day opening gross in the $14 million to $15 million range, though some box-office obsevers believe the film could approach $20 million in its four-day opening. The third new entry over the holiday weekend is Japanese animated film The Secret World of Arrietty, which Disney is distributing via its deal with Japan's Studio Ghibl (Ponyo, Spirited Away). The film, released internationally in 2010 and grossing a stellar $126 million, was directed by Hiromasa Yonebayashi, whose credits include the acclaimed Ponyo. The U.S. version of Arrietty features a voice cast led by Will Arnett, Amy Poehler and Carol Burnett. Tracking suggests Arrietty will open in the $10 million to $12 million range for the four-day weekend. At the specialty box office, the Weinstein Co. opens Oscar-nominated football documentary Undefeated in five theaters in New York and Los Angeles.